The Severn Valley Railway is getting ready to welcome visitors this weekend despite being badly damaged in Tuesday night's heavy rain. 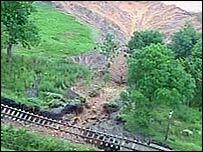 The line from Bridgnorth, Shropshire, was damaged in 45 places, including nine serious landslips. It is feared it may take until October to fully repair. A service is running from Kidderminster to Bewdley, Worcs. The Met Office has issued a severe weather warning for the West Midlands with heavy rain expected until Monday. It is feared the damage may have a knock-on effect on the economy of the area, as the railway attracts about 250,000 visitors a year. Company spokesman John Leach said: "The service has been open since 1970 but we have not seen anything like this."